A stent is a wire mesh tube that is permanently implanted in a heart artery that is partially or totally blocked. The artery can either be blocked by clot, in the case of a heart attack, or fatty tissue called atherosclerosis in patients with chest pain. Stents are advanced into the heart artery during a catheterization and opened up at the site of blockage to provide a rigid support propping open the blocked blood vessel. Studies have shown that when a patient has either a heart attack (small or large) or has pain coming from the heart (called angina) despite heart medication, stents are appropriate and very helpful to a patient’s long term health and quality of life. In the case of a heart attack stents can be life-saving. The cardiologist who is doing your catheterization (usually Dr. Tabrizchi and Dr. Najafi) will look at your arteries and advise you and your regular cardiologist as to whether no treatment, medications, a stent or coronary artery bypass surgery is the most appropriate course of therapy. Sometimes there may be a choice in which caseDr. Tabrizchi or Dr. Najafi will discuss options with you, your family and your doctor. If medical therapy is advised you can always come back later for a stent if medication is not adequate to control your symptoms. Bare metal stents – These are the original stents. They are very effective in opening up heart arteries. The disadvantage of these stents is that a blockage can recur at the site of the stent in 1 out of 6 patients requiring a repeat procedure. The advantage of this stent is that they only require only one month of blood thinner Plavix, Brylinta or Effient but a life time of aspirin therapy. Drug-eluting stents – These are bare metal stents coated with medicine that lowers the recurrence rate from 1 in 6 to 1 in 20. Their disadvantage is that patients are required to take at least 1 year (and sometimes longer) of Plavix, Brylinta or Effient. These stents are not implanted in patients who tend to bleed, need urgent surgery or who are unable to take long term anti platelet drugs. A study of the arteries, called a diagnostic cardiac catheterization, is performed to determine if there are blockages in the vessels. The stent, which is mounted on a balloon catheter, is inserted into the artery and advanced to the site of the blockage. When the balloon and stent have been placed in the target location, the balloon is inflated and the stent expands. 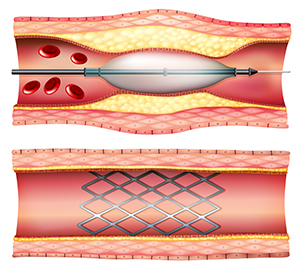 One or more stents can be used to span the length of the blockage. The balloon catheter is then deflated and removed along with the guide wire and catheter that were used to deliver the stent, leaving the stent in place. The blood thinner required after stent implantation are called anti-platelet drugs. These drugs include Plavix, Effient and the newest drug Brylinta. These should be taken with Aspirin. Neither Coumadin nor Pradaxa which are different kinds of blood thinners are a substitute for the anti-platelet drugs. There may be situations in which you will take Aspirin, an anti-platelet drug and Coumadin or Pradaxa. It is crucial to take either Plavix ,Effient or Brylinta along with an aspirin tablet for at least 1 month after a bare metal stent and at least 12 months after a drug eluting stent has been placed. Under no circumstances should another doctor advise you to stop these drugs without discussing the matter with your regular cardiologist. Failure to take either Plavix, Bylinta or Effient for the proper amount of time can result in either a heart attack or death.